I need your help. 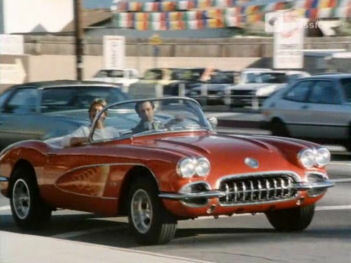 I am trying to compile the locations of many of the old TV & Movie cars we all know and love. Lots of them are still out there somewhere, in a small local museum or forgotten is someones garage or private collection. Some, sadly, have been destroyed. Below is a list and a brief description of each of the cars I am seeking. If you know where one is (regardless of condition), please drop me an email at Nkw1965@aol.com. If you find a car and can provide a photo or two, that would be even better. Thanks in advance and good hunting! The " Get Smart " Alpine gadget car. 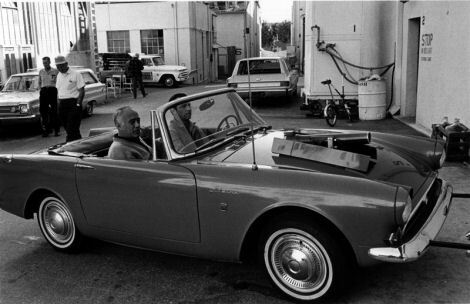 Not to be confused with the 1965 Sunbeam Tiger used in the opening credits or the 1966 Tiger given to Don Adams by the studio. This car has the cannon under the hood and revolving license plate numbers. 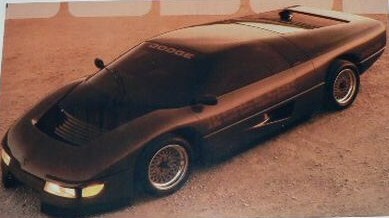 The Corvette from the "Riptide" TV show. There are two surviving cars from the movie "The Wraith". One is somewhere in Florida and the other in Kansas. The Star Car from "The Last Starfighter" is rumored to now be in France and painted red. Located in France. Painted red. Part of a Sci-Fi collection that is displayed in various museums. Due for restoration. The Chrysler Convertible used on "The Hero" was sold to the Cudahy Meat Company and has disappeared. This Cadillac Pimpmobile was pink in "Magnum Force" and a different color in "Willie Dynamite". Anycar 1 was built for an insurance company. The repainted car is rumored to reside somewhere in Europe. Located in James Hall Museum of Transport in Johannesburg, South Africa with a different Wesbank paint job. 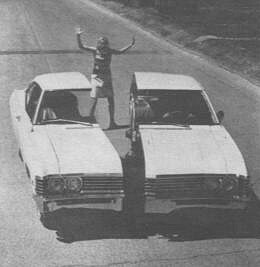 This 1967 Impala split into two separate halves for a Chevrolet commercial. Each side was drivable. It was reportedly part of the Harrah auto collection that sold in the 1980's. The "T.H.E. 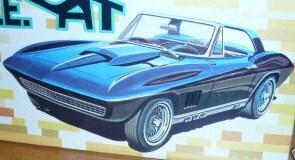 Cat" Corvette is rumored to have been wrecked and possibly totaled in California. Thanks for looking. If you know where any of these cars are, please let me know.